We founded Sacred Blossom Farm for our health, your health and the health of the planet. Our fields look like beautiful prairies with different varieties of plants mixed together in dense polycultures - this is how plants grow in nature. We hand harvest our herbs and flowers then carefully dry and hand process them to produce a unique level of quality, potency and freshness. You have never seen another herbal tea like it! Our teas are blended to support health and taste delicious. No flavor additives. Just vibrant herbs, flowers and fruit. It’s the finest beverage you can brew. Grown in poly-cultures (mixed plantings) with biologically active soil, minimal fertilizer and irrigation. Our herbs grow more slowly but are naturally rich and potent. 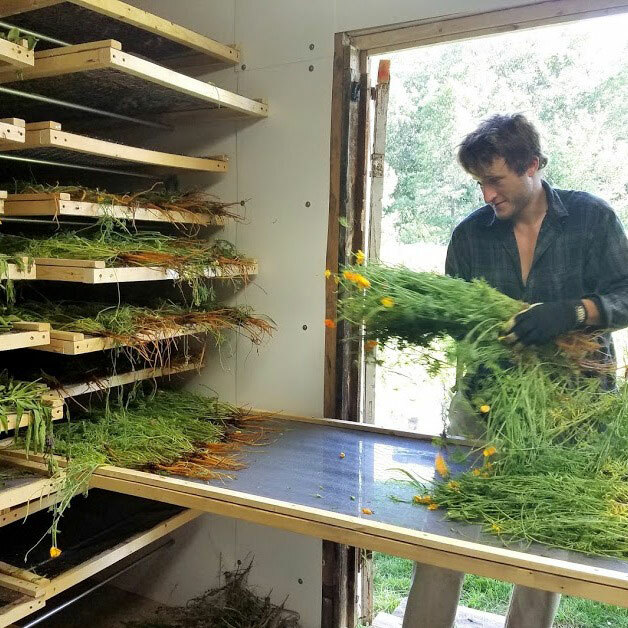 We built the largest herb drier in the Midwest so we can be patient and hand harvest only when herbs are at peak potency. We dry at low temperatures and hand process in small batches. Sacred Blossom “living herbal teas” contain superior quality dry herbs, flowers and fruit. Flavorful beyond compare. Try it.